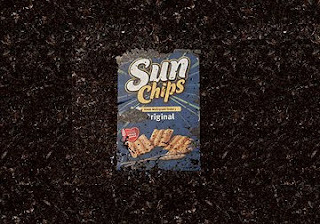 Recently, SunChips® by Frito-Lay, unveiled a 100% compostable bag for their product. This is a step they have taken after they already reduced their material usage over the past 5 years through packaging optimization by more than 5 million pounds. This new bag is an even greater achievement as it is made completely of plant products that are grown annually as opposed to petroleum which takes millions of years to regenerate. The big hype on it though is that it is 100% compostable, breaking down completely within 14-16 weeks in an ideal compost environment (over 130℉). Some consumers have been complaining about the new, louder crinkling sound of the bags. But if we are able to create a product that can break down in only 3-4 months (as opposed to lifetimes in a landfill) shouldn't this be easily dismissed as a minor issue? The purpose of this bag is to benefit the environment, both through immediate results of compost and by bringing the practice of composting more public awareness and into the forefront of sustainable living.